M&T Bank clients can manage their financial accounts online, through the M&T online banking platform. The platform can be accessed through the main M&T website, www.mtb.com. Access to your personal account will be secured by the M&T online banking login form. With the M&T login, you get immediate access to online bill pay, fund transfers, electronic statements, and balance notices. The web portal also comes with FinanceWorks to help you budget, control your spending, and achieve your financial goals. This informative step-by-step instruction guide will walk you through the M&T login process for multiple devices, including computers, laptops, tablets, and smartphones. M&T Web provides a user-friendly login interface that offers you secure access with your confidential username and password you set up at enrollment. The instructions below will help you log in from your desktop or laptop. If you are more interested in the M&T mobile banking login, skip to the next sections. Open the main M&T Bank website, www.mtb.com. Find the light green Log In button in the upper right corner of the www.mtb.com landing page and click on it. The M&T online banking login form will appear on your left. In the first space of the form, fill in your M&T online banking username in the field marked User ID. 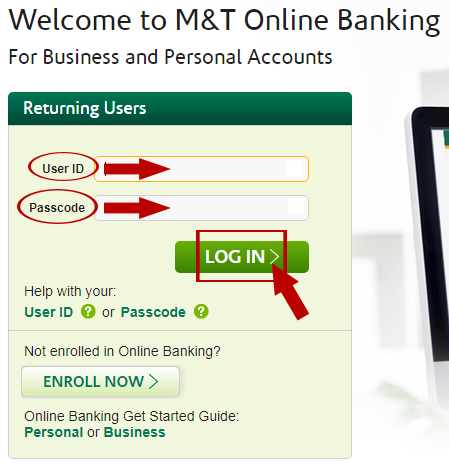 Write your M&T online banking password in the field marked Passcode. Click the light green Log In button. There is an alternative method to complete the M&T login procedure. This alternative is described below. On the right, you have the option of selecting a different type of account to log into. Select your Online Banking account from the list. This will open the M&T online banking login menu on a new page. You will first need to provide your username in the User ID box. Type your password into the Passcode box. Open the M&T login portal for mobile devices. Provide your username in the User ID field. Type your password into the Passcode field. Check the Remember My User ID checkbox if you want to save your username. Search for M&T Mobile Banking in the App Store. Install the M&T Mobile Banking app to your device. After installation is complete, tap the green M&T icon to launch the app. Click the green Log In button. Download M&T Mobile Banking on Google Play. Install the M&T Mobile banking app and its updates. Provide your login credentials in the User ID and Passcode boxes. Tap the green Log In button to verify your credentials and complete the login process. If you encounter trouble accessing online banking, ensure your web browser is updated, your Internet service is connected, and your security settings are adjusted to allow cookies and pop-ups from the M&T site. For issues with the mobile application, update the application or try uninstalling and reinstalling it. You can obtain assistance with login issues on M&T’s website. They offer an easy to use online enrollment through their Enroll Now link. The site also provides a Reset Your Passcode link to assist you with password issues. For further assistance, check out the FAQ or contact their Online & Mobile Banking number at 1-800-790-9130. You can learn more about M&T online banking services and M&T mobile banking services from the special section on their main website. On the www.mtb.com website, you can also find a handy M&T branch locator tool, that allows you to find the nearest M&T Bank. With this tool, you can also see the M&T Bank hours of specific location, and their contact details. If you would like to leave M&T feedback or ask a question, you can complete their customer experience survey, available on their main website. If you are interested in mentioning a specific M&T employee and praising them for their outstanding customer service, there is a separate form to complete, the Service Excellence Form. To contact the M&T Bank customer service department for issues which are not related to the online banking platform, you can browse through their Contact Us page, www.mtb.com/help-center/contact. Here you will find a list of all the M&T customer service departments and their contact details.